Sometimes it makes sense to have all your eggs in one place. We frequently encounter new prospective clients that not only have multiple employees sometimes engaging in similar tasks but that are also having to deal with multiple vendors…too many vendors. One vendor for this, one vendor for that, ten vendors for numerous other things. Stop the madness! When you work with Identity Works consider us that big red phone that you pick up for everything you need including your marketing emergencies. 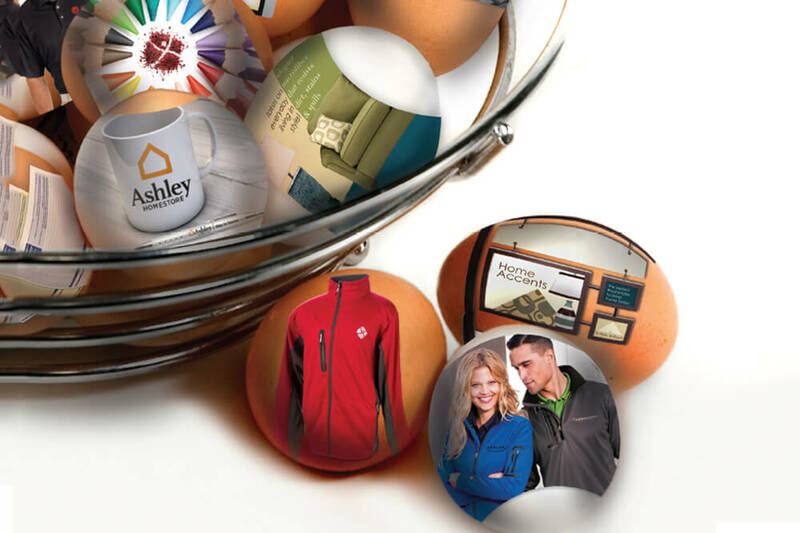 Whether you need promotional products, corporate apparel, a new logo, a new website, social media management, help with branding or design work, trade show items, banners, table throws, signage, point of purchase products, retail store supplies, and well, you get the picture. We’ve made a whole lot of prominent organizations much more efficient by offering all these services under one roof and providing a customized QuickBrand Online Store as the central ordering hub for all departments and employees. If you’re feeling overwhelmed, contact Identity Works today and find out how we can make your job so much easier. We promise, we’ll make you look really good. We needed to have over 20 logos redesigned. "Working with Identity Works was a great choice. We were able to develop a process that worked for both our company and their designer, to get logos that best represented our apartment communities. Whether you are doing one or many, I would recommend Identify Works. I look forward to working with them again on futures design needs." Successfully increased brand awareness with our target market. "Identity Works delivered an integrated marketing campaign across advertising, promotional products, literature, and trade show design. They built a completely custom web-based marketing tool that tied it all together. Collaborating with our in-house marketing department, they launched a new marketing strategy that successfully increased brand awareness with our target market." All of our clients have a dedicated Account Manager who acts as a first point of contact for any questions, requests, or needs. Should your Account Manager not be available, their dedicated backup will be more happy to assist you! If you have a QuickBrand Online Store with Identity Works, your Account Manager also acts as a first point of contact for your employees with any inquiries they have related to your store, the products, or individual orders. While we cross-train our staff extensively, it’s important to have subject matter experts. Our Business Area Specialists are a resource for our clients and Account Managers to come up with creative ideas and solutions for fulfillment, retail POP & merchandising, creative design, branding, importing, direct mail, employee and customer incentives, tradeshow booth design, SEO/SEM, social media campaigns, and more. We believe strongly in the power of brainstorming and collaborative thinking. Our team uses bi-weekly ClientSpire sessions to discuss upcoming projects, share client successes, and think creatively about the challenges our customers face and how we can help solve them. Each client is assigned a specific Account Management Team. This team gives you concierge level service and client specific ideation paired with accurate product that is delivered on time. Your Creative Consultant will dive deep with you to understand your business, brand, culture, and strategic goals to create a personalized project/idea calendar that is used to provide you with proactive and personalized suggestions throughout the year. Our Creative Consultants also help our clients plan events and uncover solutions to solve marketing, HR, and branding challenges.